We missed a good anniversary last month: the French writer Francis Jammes (1868-1938) was born 150 years ago on 2 December. Not only that, he died 80 years ago on 1 November. A sound Catholic, he would have been a perfect subject for a meditation on All Souls' Day (2 November). 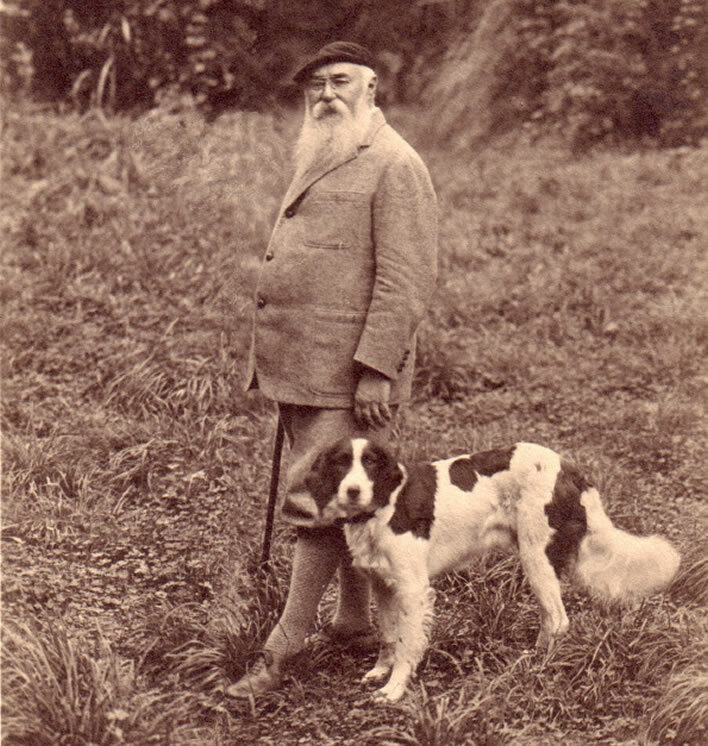 A photograph of Francis Jammes taken at the family home in Orthez, a town in the south-west of France, close to the Spanish border. (département des Pyrénées-Atlantiques, région Nouvelle-Aquitaine). 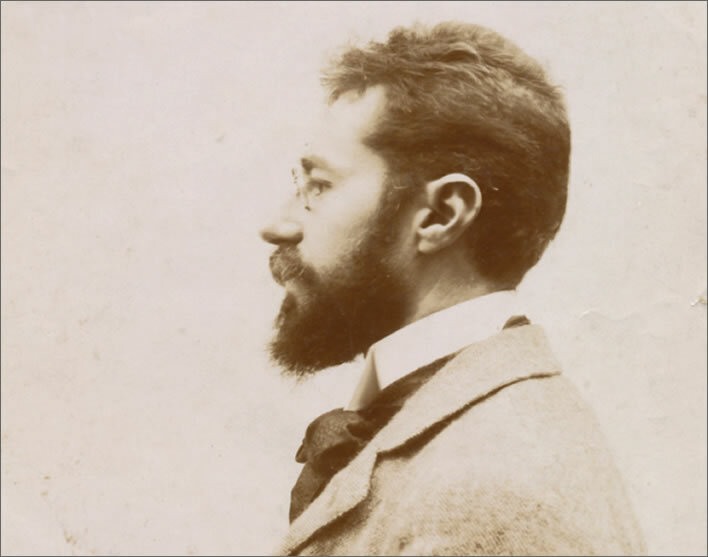 The photograph dates from 1900, when Jammes was around 31 years old. Image: Fonds Association F. Jammes Orthez. Which dereliction means that he is now available to cheer us up in this bleak, northern-hemispheric midwinter and this roasting southern-hemispheric midsummer. Unlike the more famous French writers of his era, Jammes wrote comprehensible and enjoyable prose and poetry. Nor was he metropolitan: he was Basque born and raised and he lived and died there – his favourite headwear the Basque beret. That makes two considerable barriers to an entry into the French literary pantheon in two short sentences. 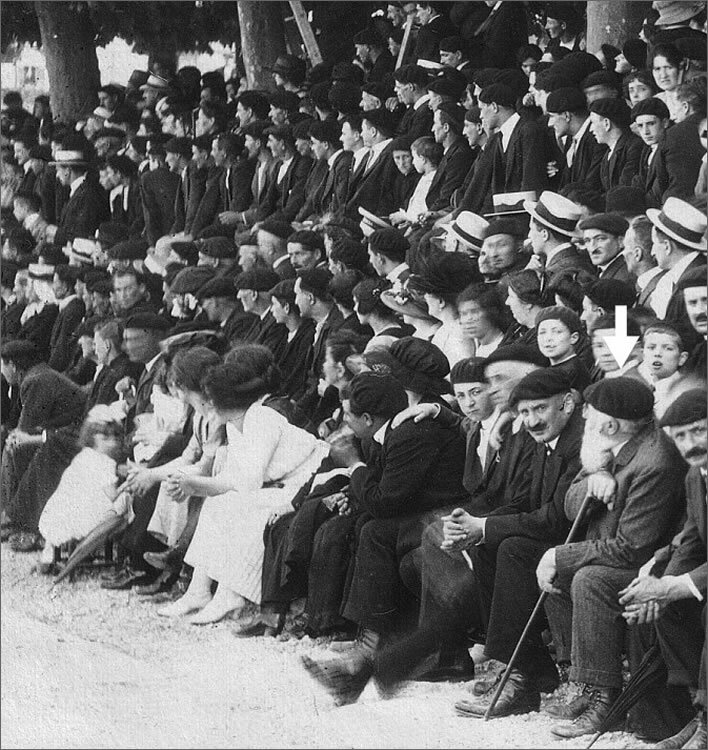 A photograph of an older Francis Jammes (bottom right) taken at a game of pelote, the Basque speciality. Jammes and most of the male spectators are wearing that other Basque speciality, the beret. Image: Fonds Association F. Jammes Orthez. Here's one of his deservedly most famous works, Prayer VIII in his collection of Quatorze Prières, the first edition of which was published in July 1898, when he was 29 years old. 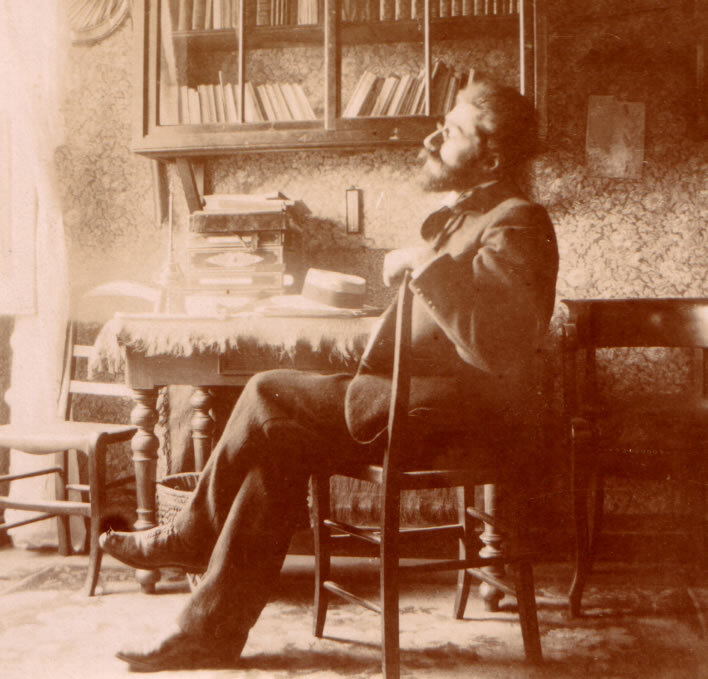 Francis Jammes photographed in 1898, the year of the publication of Quatorze Prières. Image: Fonds Association F. Jammes Orthez. When it is necessary to go to you, O my God, let it be upon a day when dust hangs festively in the countryside. I would like to choose a route, just as I did on Earth, upon which I could walk as I liked to Paradise, where the stars shine during the bright day. car il n'y a pas d'enfer au pays du Bon Dieu. I shall take my stick on the great road and I shall say to the donkeys, my friends: I am Francis Jammes and I am going to Paradise, for there is no hell in the land of the good God. That I appear before you in the middle of these beasts whom I love so much because they gently bow their heads, and, standing, join their little feet in a gentle manner that makes one pity them. I shall arrive followed by their thousands of ears, followed by those who carried baskets on their flanks, by those who dragged the waggons of acrobats or waggons decorated with feathers and tin, by those who carried on their backs bent cans, by the she-donkeys, full as wine-skins, staggering, by those wearing small trousers because of the bloody and weeping wounds around which swarms of relentless flies gather. My God, permit me to come to you with all these donkeys. Let it be that, in peace, some angels guide us towards the verdant streams where cherries tremble, smooth as the laughing flesh of young girls and let it be that, resting in this place of souls by your divine waters I can be like the donkeys, who mirror their humble and gentle poverty in the limpidity of the eternal love. Jammes, Francis. Oeuvres de Francis Jammes (1868-1938), 1913, Mercure de France, Vol. 2, p. 20. English translation ©Figures of Speech [reproduction only accompanied by a link to this page]. Neither do I wish to convey the idea that none of this long line of poets was a cynic by nature. Musset, Baudelaire, and Verlaine had every reason to be unhappy, both because of their temperaments, and because of the events their temperaments led them into. But what was undoubtedly true of a few men, was equally undoubtedly a convention with the majority. "Interiority" was the fashion; a poet examined his mental processes under a microscope until he was like the gentleman in the story who had everything but "housemaid's knee." Such a state of things was really utterly insupportable. Musset drank himself to death; Verlaine and Huysmans fell exhausted into the arms of the Church; Rimbaud took refuge in the Orient, married a native wife, and wrote no more poems; and the greater number undoubtedly learned to enjoy their little pleasures and comforts with agreeable calm, although they continued to write as though suicide were just round the corner. Lowell, Amy. Six French poets; studies in contemporary literature, p. 214f. Francis Jammes is the poet of contentment, of observation, of simplicity. He is the poet of hills, and fields, and barns, not of libraries and alcoves. His poetry blows across the scented verses of the '90's like the wind from one of the snow-capped peaks of his native Pyrenees. Jammes loves all animals, but apparently dogs and donkeys best. In another book, we shall find a whole series of poems to the latter. James was not just a lifelong lover of animals, he was a passionate hunter and fisherman. Here he is photographed in 1925 with his dog Sultan. Image: Fonds Association F. Jammes Orthez. The cornucopia that is the internet contains an excellent tribute site to Jammes as well as many of the texts of his poetry and, of course, the text of Amy Lowell's homage – all linked above. Cheer up – soon be February!